EASTER 3 NIGHTS WITH LATE 3PM CHECK-OUT. LUXE AND ENJOY! Luxury Coastal Bayside Living metres to the Bay Beach, Blairgowrie Village Shops, Cafes and Restaurants and Blairgowrie Yacht Squadron. Live the enviable Beach Lifestyle in this stunning Architect Designed Coastal Residence of vast spaces, facilities and features providing a high Level of Living Indoors & Outdoors all year round, capturing the ultimate Beach & Coastal Lifestyle and in prime position with Cafes and Restaurants, Shops and Bay Beach almost at the Door! And just a short stroll to Blairgowrie Yacht Squadron. The Residence is stylishly Furnished and Equipped in Beach Designer providing for both Informal & Formal Living and Entertaining and surrounded by Vast Entertaining Sun Decks and Areas, a 40ft (12mtr) Lap & Leisure Pool and a fully appointed All Weather 'Pool House' with Hotel style Club Lounge, Dining, TV and separate Bathroom with Shower & Toilet. 3 Zoned Living areas including separate Dining, 2 Bathrooms plus Guest Powder Room & Open Planned Kitchen. Air-Conditioning, Ducted heating & Direct access into the Residence from Remote Double Garage. * Master Suite - QS Bed, Walk-in Robe & ensuite & opens out to a private Court. * 2nd Bedroom - QS Bed, Built -in Robe & opens out to Sun Decking. * 3rd Bedroom - 2 King Single Beds, Built -in Robes. * 4th Bedroom/Study with Double Sofa. * Living 1 - Spacious with Stone Feature Fire Place & outlooks The Pool & Entertaining Court. Plasma TV. * Living 2 - Spacious, Plasma TV, DVD & open planned to the Kitchen. * Living 3 - Dining 8-10 Seated and opens out to the Entertaining Decks and Areas. * Kitchen - Open Planned and with a large Stone Island Bench,900s Oven & Gas Hot Plates, Dishwasher, Microwave, Big Pantry & Ample Cupboards. * Laundry - Washing Machine & Clothes Dryer. * 40ft (12mtr) Lap & Leisure Pool. * 'Pool House' - Cabana - with Club Lounge, Plasma TV, 10 Seated Dining, Hot & Cold Kitchen Sink and Benches, Refrigerator, fitted BBQ. * Bathroom with separate Shower, Toilet and Vanity. * Vast Entertaining Decks with all weather areas with Lounges & Settings. 'WHITE-HAVEN" is IMPRESSIVE! and ideal for a Couple or up to 8 persons (maximum 6 Adults with 2 Children) seeking Executive Standard Beach Accommodation offering the ultimate Lifestyle facilities and features in prime position. *$40pp - Beds are made up with Hotel Quality Linen and Towels, Hand Towels, Bath Mats, Face-washers and Tea Towels provided. 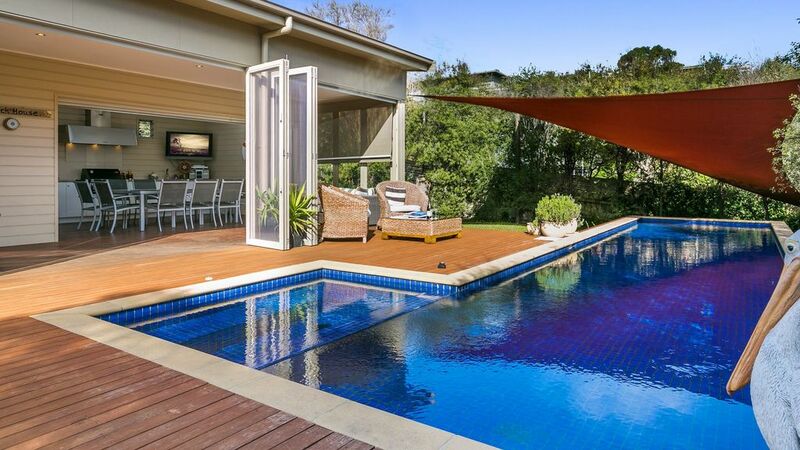 The property is in a great location and the pool was a great hit. Unfortunately the rest of the house was quite basic. There isn’t any wifi, you can’t even plug your phone into the stereo system as it’s all very old analog technology. One of the Foxtel boxes wasn’t working, nor was the coffee machine. Most of kitchen utensils are rusty and very old and need to be replaced. This place has the potential to be a real gem but wasn’t worth the premium we paid over the Christmas break. Having said that Christine, the property was extremely helpful and lovely to deal with. The owners just need to take more pride in their home and some of the finer details to make it a more comfortable stay. A great property close to the beach where we could relax in between playing rounds of golf at some of the best courses along the peninsula. A great time had by all. We enjoyed every minute of our stay at White-Haven. The property is beautiful and spacious, the cabana being an extra bonus. We loved Blairgowrie and the location of the property is excellent, just a short stroll to the shops, cafes and beach. This was a lovey property, very spacious with everything you want. Thoroughly enjoyed our stay. We had a wonderful stay there, everything was perfect and Christine who in charge of the property she was super helpful and lovely.